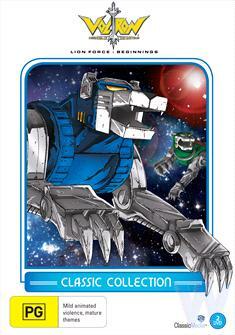 Voltron Lion Force Beginnings Classic Collection DVD Review This is a decent collection, bare of extras, but really, this is just an introduction set. I would love to see some kids of today take a look at this series and others from that time. They might just be happy that their parents showed it to them. Ah, the 80’s. Back when cartoons were awesome! It’s disappointing to see what cartoons kids watch these days. I remember growing up and being able to watch so many great shows, which I have very fond memories of. Transformers, G.I. Joe, Robotech, Thundercats and of course, Voltron: Defender of the Universe. Voltron: Defender of the Universe tells the story of a specially trained super force of space explorers, sent by the Galaxy Alliance to search the universe for the legendary super robot, Voltron, which they can use to battle the evil King Zarkon and his Drule Empire that threatens the galaxy. Their search leads them to Planet Arus, ruled by Princess Allura. Here they find the five mythical robot lions that come together to form the mighty Voltron. The team soon become The Voltron Force and pledge themselves to the protection of Planet Arus against King Zarkon, his son Prince Lotor and the evil witch Hagar. Voltron - Lion Force: Beginnings is a perfect introduction to the fan favourite series! With 18 episodes across two discs, it’s a great way for newcomers or people with general interest in the show to become acquainted of the retro 80’s series. The episodes included are a compilation from across the entire series, so if you are expecting any sort of continuity, then this isn’t for you, but for people who grew up with the series and want to show it to their own children, then you can’t go wrong with this two disc set! For the episode quality, we aren’t treated to anything special. These are the best the episodes have ever looked, but that’s only because of the DVD format. Note, this isn’t a digitally remastered set, so picture quality and sound are as you watched them way back in the late 80’s, only with the thanks of the digital age to show these episodes at their best, but hey, we’re not complaining, this is Voltron we’re talking about! We children of the 80’s appreciate them as they are, because you can’t beat those fond memories. This is a decent collection, bare of extras, but really, this is just an introduction set. I would love to see some kids of today take a look at this series and others from that time. They might just be happy that their parents showed it to them.